Within a SELECT statement, multiple tables can be joined together, columns can be selected, new columns can be generated, and functions and global variables can be used. It is even possible to nest multiple SELECT statements or to add common table expressions (CTEs). In this way, SELECT statements get more and more complex, but the same SELECT statement must be run from within different programs written in different programming languages. Instead of duplicating the same SQL code over and over again, those SQL statements should be stored within a single place that can be reused. SELECT statements can be reused by embedding them in a SQL view or stored procedure. A UDTF is another mechanism that allows SELECT statements to be reused by many programs and also provides the ability for multiple statements to be performed before returning the final result set. A UDTF can also help to work around the limitation that traditional SELECT statements can only directly access data stored in DB2 tables. If data in non-DB2 objects, such as data areas or stream files located within the IFS must be processed, programs written in a high-level language (HLL) can be registered as an external UDTF. A scalar user-defined function (UDF) can be written with SQL or can be an HLL program that is registered with the CREATE FUNCTION statement. A scalar UDF can be used within SQL statements (SELECT, UPDATE, INSERT, DELETE, SET, and so on) similar to any built-in scalar function, such as SUBSTR, ABSVAL, or DAYOFWEEK_ISO. A user-defined table function is implemented similar to a UDF but can return a set of values instead of a single value. This returned set of values can consist of multiple columns and multiple rows similar to a DB2 table. A UDTF is also created or registered with the CREATE FUNCTION statement. Input parameters may or may not be defined. The RETURNS TABLE clause is used to define the attributes of the output columns. SQL UDTF The UDTF is created with the CREATE FUNCTION statement and can consist of either a single or multiple SQL statements. A SQL UDTF example is shown in Listing 3. The UDTF result set is determined by the SELECT statement that is specified within the RETURN statement. The number of columns specified within the SELECT statement must match the number of columns defined in the RETURNS TABLE clause. The data types of the selected columns must also be at least compatible with the output column data types. Note: If all data can be accessed with a single SELECT statement (independent of the number of views, CTEs, or nested sub-selects that are involved) creating a view instead of a UDTF is the better choice. The running of a UDTF produces some overhead compared with accessing a view. External UDTF: An external UDTF is a HLL program that is registered with the CREATE FUNCTION statement as a UDTF. A UDTF must be specified within the FROM clause of an SELECT statement in composition with the TABLE-function clause. In Listing 1 the USERS UDTF provided by IBM and located in the QSYS2 schema is run. The USERS UDTF is invoked without any parameters, and therefore, the function name must be followed by an empty parenthesis. When using the TABLE-function clause, specifying a correlation name is mandatory. The correlation name used in Listing 1 is uu. The USERS UDTF returns a table containing all user profiles and profile descriptions in a second column. An excerpt of the result table returned by the USERS UDTF is shown in Figure 1. Because a UDTF is specified within the FROM clause, its result set can be handled similar to any table or view. For example, a UDTF result set can be joined with other tables or views, columns can be selected, WHERE clauses can be added for reducing the data to be returned, data can be condensed by using aggregate functions, and data can be sorted in any sequence. The examples in Listing 2 show different invocations of UDTFs. In the first example, the USERS UDTF is run again, but only the user profiles beginning with “TM” are returned. In the second example, the ListMember_Fnc UDTF is called. ListMember_Fnc is an external UDTF that returns all members located in a source file. The source file and the library are both passed as parameter values to the UDTF. Depending on the WHERE conditions, only members with the member types RPGLE and SQLRPGLE as well as the member name containing LIST are returned. The source code for the ListMember_Fnc UDTF is published and it is explained later in this article see ( External UDTF returning data out of a user space filled by a System API). In the third example, the ListMember_Fnc UDTF is called twice. With the first execution, all members in the QRPGLESRC and the HSCOMMON10 library are returned. With the second execution, all members in the QRPGLESRC file and the HSCOMMON05 library are returned. The results of both UDTF calls are joined together with a FULL OUTER JOIN by connecting the member names to find out the members that are in one source file and not in the other one. The easiest way to explain something is to present an example. You may have some critical queries, where you need to capture who is running a specific query and when the query is used. So, one solution to this requirement is to write a UDTF for each of these queries that inserts an audit row into a log file before running the query. Instead of running the query directly, the user can run the appropriate UDTF either directly or through a view that includes the UDTF call. Listing 3 contains an example of this type of UDTF. The LogUser_Fnc UDTF returns a subset of columns from the address master table (2). Before running the query, an INSERT statement is performed that writes information about the user and run time into the LOGFILE audit table (1). Another need may be analyzing information provided by control language (CL) commands. A lot of CL commands provide an option for returning the selected information into an output file (*OUTFILE) that itself can be processed easily with SQL. The DSPOBJD (display object description), DSPUSRPRF (display user profile), DSPJOBLOG (display job log) and DSPFFD (display field file description) commands are only a few of them. A SQL UDTF allows you to first transparently run the CL command writing the required information into an output file. The content of this temporary output file can then be processed by coding a SELECT statement that accesses the temporary table in conjunction with the RETURN statement. Listing 4 shows the SQL for the DspObjOwn_Fnc UDTF. This UDTF returns all objects owned by the user profile that is passed as an input parameter value. The DspObjOwn_Fnc UDTF returns a subset of the columns out of the generated output file. The columns to be returned are defined in the RETURNS TABLE clause. The UDTF first checks the input user profile value. If a value is not passed, the UDTF uses the session user (current user profile) (1). The DSPUSRPRF command is run by calling the QCMDEXC (Execute Command) stored procedure (2). The result out of the CL command is written to the TMPOBJOWN file located in the QTEMP library. The values are retrieved from in the temporary table by running the RETURN statement with the associated SELECT statement (3). The numeric date and time column values from the command output file are converted into SQL timestamp values (4). In Listing 5, the DspObjOwn_Fnc is run to return all objects owned by the HAUSER user profile. Based on the WHERE conditions only, data areas, binding directories, and modules for the input user are returned. The result table returned by this query is shown in Figure 2. Running the CL commands that populate data into an output file can add some overhead to the system. So you might need to consider creating an external UDTF to directly use data from system APIs instead of CL command output files. Even though UDTFs can be easily written with pure SQL, a SQL UDTF can only access data stored in externally described DB2 tables. Accessing data in non-DB2 objects, such as data areas or program-described files cannot be done easily with SQL. On the other hand, programming languages might provide functions for accessing and processing data in non-database objects. With External UDTFs these additional features provided by the IBM i programming languages can be wrapped and for using them from within SQL. In computer programming, a callback is a piece of executable code that is passed as an argument to other code, which is expected to call back (run) the argument at some convenient time. The chart in Figure 3 demonstrates how callback processing works. 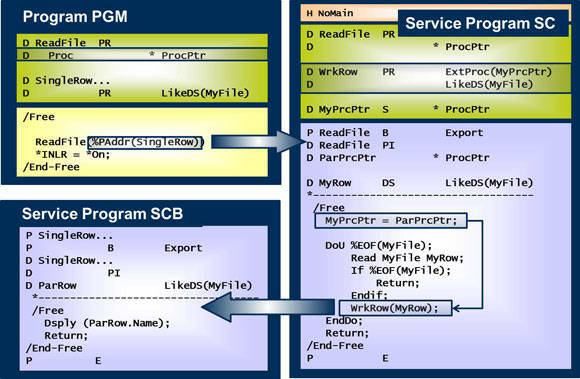 The PGM program calls the ReadFile procedure located in the SC service program and passes a reference (procedure pointer) to the SingleRow procedure located in the SCB service program as a parameter value. The ReadFile procedure in the SC service program reads the MyFile file in a loop. For each record that is accessed, the procedure whose reference was passed as parameter is run (the SingleRow procedure in this example, but might be any other procedure with the same parameter definition). A data structure containing the previously read record is passed to the called procedure (SingleRow). After the called procedure (SingleRow) is ended, control goes back to the invoking procedure (ReadFile) that continues reading the next record. The ReadFile procedure is terminated after the last record is processed. IBM uses callback processing methods for activating external UDTFs. After all rows have been returned (close call). A program or procedure located in a service program can be registered as an external UDTF by running the CREATE FUNCTION statement. Input parameters All input parameters must be defined. This definition must exactly match the data type, length, and sequence of the input parameters within the HLL program. Note: The SQL interpretation of data types and lengths may differ from the definitions allowed within the HLL. For example the maximum length of a character field within RPG is 64 KB (release V5R4M0) and 16 MB (higher releases), while the maximum length for a character variable accepted by SQL statements is 32 KB. There may be also some issues when passing date values. For example, in RPG a date format other than ISO can be used, while SQL always expects ISO formatted dates to be passed. To avoid any problems with date parameters, the DATFMT(*ISO) keyword should be added to all date parameter definitions within the appropriate prototypes and procedure interfaces. Output parameters – Table definition For a UDTF, all columns to be returned must be defined (name and data type and length depending on the data type) in composition with the RETURNS TABLE keyword. The column definitions within the RETURNS TABLE clause must be an exact match (to the data type, length, and sequence) of the output parameters defined in the HLL program. Language The programming language in which the program to be registered is written must be specified, for example RPGLE, COBOLLE, or CLLE. If a program containing embedded SQL is registered, the programming language value to be specified is still RPGLE or CLE and not SQLRPGLE or SQLCLE. Parameter style SQL Parameter style SQL is mandatory for all external UDTFs that are not written in Java. The parameter style SQL not only requires all input and output parameters to be defined in the parameter list of the HLL program, but also requires NULL indicator variables for all input and output parameters. The SQL parameter style also requires several other parameters for exchanging information between the invocation program and the UDTF, among them the SQLSTATE and the call type. Final call / No final call Normally, a UDTF is called at least three times with three different call types, that is, OPEN, FETCH (that can be repeated x times) and CLOSE. When specifying the FINAL CALL option, two additional invocations will occur. The first one before the open call (as first call) and the second one after the close call (as final call). The FINAL CALL option is used if additional operations must be performed before the open or after the close call. For example, before opening your files that are accessed with native I/O, you might intent to set the library list first. Or, when using List APIs, you might plan to create and populate the user space with the first call and delete the user space with the final call. Scratchpad The SCRATCHPAD attribute provides the ability to define a memory area that can be shared across calls to the registered program. The SCRATCHPAD attribute is not mandatory. Instead, the information can be stored in either global variables or local static variables within procedures to keep data persistent between different program calls. When using the SCRATCHPAD attribute, the appropriate parameter must be defined as data structure in the HLL consisting of an integer sub-field containing the length of the second sub-field, a fixed length character variable. Listing 7Listing 7 shows the registration of the LISTMEMBER procedure located within the LISTMBR service program in the HSUDTF library (8) as ListMember_Fnc (1). The ListMember_Fnc UDTF expects two varying length input parameters representing the file and library names (2) and returns a table consisting of seven columns (3). The procedure is written in RPG (4) without using any SQL (5). When running the procedure, a first and final call (6) must be performed. The DISALLOW PARALLEL and NOT FENCED attributes should be specified if the procedure is written in a programming language that is not multithreading-capable (7). Besides all input and output column parameters that are specified in the CREATE FUNCTION statement, the SQL parameter style requires additional parameters to be included in the procedure interface or entry parameter list. These additional parameters are passed by the DB2 invocation program for exchanging information with the HLL program. Indicator variables for all input and output parameters An indicator variable, passed as 2-byte binary value (5I 0) must be defined for each input and output parameter for indicating whether a NULL value was passed. SQLSTATE – Output parameter SQLSTATE is a 5-character output parameter that can be set within the HLL program or procedure for indicating the success or failure of the execution. The programmer can set the SQLSTATE parameter to any valid value. As soon as the last row is consumed, the SQLSTATE output parameter must be set to ‘02000’ for indicating to the invocation program that all data retrieval is complete and the close call can be initiated. You can find detailed information about the SQLSTATE concepts and messages at the IBM i information center. Function name – Input parameter The function name parameter is a 517-character varying length input parameter representing the fully qualified function name. Specific name – Input parameter The specific name parameter is a 128-character varying length input parameter representing the specific name. Message text – Output parameter The message text parameter is a 1000-character varying length output parameter for returning an individual error message text in conjunction with an individual SQLSTATE. Scratchpad – Output parameter If the SCRATCHPAD attribute is set for storing information between the different program calls, the SCRATCHPAD parameter must be defined after the message text parameter. Otherwise the call type parameter follows immediately after the message text parameter. Call type – Input parameter The call type input parameter must be defined as an integer parameter and is the most important parameter. It is set by the invocation program immediately before calling the HLL program/procedure to one of the following constant values: -2 = First call will be passed only if the FINAL CALL option is explicitly set within the CREATE FUNCTION statement. -1 = Open call is the first invocation of the program if the FINAL CALL option was not specified. When using global or static variables for keeping information persistent between the program or procedure calls, the open call is a good place for initializing them. If the SCRATCHPAD attribute is used, memory is allocated and initialized before the open call. When using record level access (RLA) within the external UDTF, the files to be accessed should be defined as user opened. The files should be opened and positioned at the beginning of the data with the open call and closed if the close call is performed. 0 = Fetch call will be run repeatedly until the SQLSTATE parameter is set for indicating the end of processing (SQLSTATE 02000) or for indicating an error. 1 = Close call is run after all data is processed and it allows to perform any external end processing, for example closing user opened files, deleting temporary objects such as work files or user spaces, and so on. 2 = Final call will only be performed if the FINAL CALL attribute is explicitly set within the CREATE FUNCTION statement. To make the source code easier to read, I defined named constants for the call types and stored them in a separate source member (QSRC,CALLTYPE) that is integrated as copy member in all of the subsequent examples. Listing 9 displays the prototype (parameter definition) for the ListMember procedure in the LISTMBR service program. The CREATE FUNCTION statement for registering this HLL procedure is shown in Listing 7. Within the prototype, first the two input parameters are defined (1), followed by the output parameter definition, to match the columns specified in the RETURNS TABLE clause. In the CREATE FUNCTION statement, only the input and output parameters are defined. When using the SQL parameter style, the DB2 invocation program passes additional parameters for communicating with the HLL program. These additional parameters must be defined in the parameter list. For each input and output parameter, a NULL indicator parameter variable (3) must be included. Additional parameters for the SQLSTATE parameter (4), function name (5), specific name (6), message text (7) and call type (8) must be defined. After having explained all components for writing external UDTFs, let’s review the source code for several external UDTF examples. To keep the source code as simple as possible, prototypes, reference fields, data structures, and call types are externalized in copy members and are integrated by using either the /COPY or /INCLUDE compiler directive. The copy members are all available in the attached downloadable source code. The following screen capture displays the content of the program-described file SPLITF located in the HSUDTF schema. This file consists of three character columns, representing the first name, last name, and the city. The zip code is stored between the last name and the city values in a 5-digit packed format. The last value in the record is an 8-digit packed value representing a numeric date (birthday) in the format YYYYMMDD. Accessing this table directly, splitting the row information into columns, and converting the data into character, numeric, and date values with pure SQL is rather complex. With programming languages such as RPG and COBOL on the other hand, the records can be easily read into internally described data structures and the data is magically returned as columns. Listing 10 shows the source code for the SPLITFU program in which the program-described file is read sequentially into an internally described data structure and the content of the data structure sub-fields is moved into the output parameters. The SPLITFU program is registered with a function name, SplitF_Fnc. In this UDTF example, there wasn’t a requirement for input parameters, and therefore, none are defined. (2). An output parameter is defined for all of the columns to be returned (First Name, Last Name, Zip Code, City, Birthday). Even though the character fields and the data structure subfields are defined as fixed length character fields, the output columns are defined as varying length variables. Leading and trailing blanks are trimmed off the subfield values. Converting fixed length character values into varying length character values is not required, but used in this example, mainly because varying length values can be concatenated easier. The zip code is returned as a packed value. Five NULL indicator parameters for indicating NULL values are defined for the five output parameters. The SQLSTATE, function name, specific name, message text, and call type parameters follow the indicator parameters and are defined as described before (5). The DSSplitF data structure for receiving the data is defined as a qualified data structure. The data structure subfields are defined by only specifying the data types and data lengths (6). With each invocation, all output parameters are initialized independent of the current call type (just to make sure that no invalid data from any earlier call is returned) (7). When the open call is performed, the SPLITF file is (user controlled) opened and positioned before the first record. The program ends after the file is opened (RETURN opcode) (8). Each time the fetch call is performed, the next record is read into the DSSplitF data structure (9). As long as the end of file is not yet reached, the content of the data structure subfields is moved into the output parameters. Because the character columns are defined as varying length parameters, leading and trailing blanks are trimmed off the fixed format subfield values using the %TRIM built-in-function. The numeric date is converted into a date value by using the %DATE built-in-function. For invalid numeric dates, the default value (0001-01-01) is returned (10). If the end of the file is reached or the close call is performed, the SQLSTATE output parameter value is set to ‘02000‘. The SPITF file is closed and the program is ended (11). After the SPLITFU program is compiled successfully, it is registered as an external UDTF by running the following CREATE FUNCTION statement. The RETURNS TABLE clause must match the output parameter definition within the HLL program. Because the character columns are defined as varying length character fields within the RPG program (15A Varying), the VARCHAR data type must be used. The packed data type defined in RPG is identical to the DECIMAL data type. An invocation of the SplitF_Fnc UDTF is shown in Listing 12. While running the UDTF, the SPLITFU program-described file is read sequentially and the record data is extracted into columns. Note: The SplitF_Fnc UDTF is based on a traditional RPG program that means the library list in the environment where the UDTF is run must be set correctly. In environments where SQL naming conventions are used, the default or the current schema is searched to find unqualified, specified tables or views in SQL statements. However, the current schema is not used to find files accessed with native I/O in HLL programs. The following example shows the result table returned by the previous query. By specifying a WHERE clause, the result is limited to rows with a zip code higher than 75000 and a birthday after January 1, 1975. Accessing data located in stream files such as (comma separated values) CSV directly with SQL might not be easy, because the content is normally not stored in columns with an identical length. The data has to be read sequentially and the data splits depending on the embedded separators. Most HLL include predefined functions for reading and writing stream files and even SQL provides a method by using file reference variables for accessing data located within the integrated file system. Figure 6 shows the Sales1.csv file located within the /home/Hauser directory within the integrated file system. Each row of the Sales1.csv file consists of five columns (Customer No, Item No, Item Description, Sales Date, and Amount) separated by a semi colon (;). Each row ends with carriage return-line feed (CRLF). Text information and date values are enclosed within double quotes. Trailing blanks have been trimmed so the column information does not always start in the same position. Listing 13 contains the source code of the SalesCsv procedure located in the READCSV service program. This procedure will be registered as the SalesCsv_Fnc UDTF. Within the SalesCsv procedure, the IFS file, /home/Hauser/Sales1.csv is accessed. The data between the current position and the next CRLF is read, split into columns, and the surrounding double quotes removed. The sales date is converted into an SQL date value, while the amount is converted into a numeric value. In this example, the data in the IFS file is accessed with embedded SQL by using a character large object (CLOB) file reference variable. Instead of using embedded SQL, stream file APIs might have been used for accessing the IFS file data. The stream file APIs might be more flexible than the file reference variables and may also perform better. But, file reference variables are easier to implement and understand because pointer handling is not required. CLOB file variables can be used within (embedded) SQL statements similar to any character variable. In this way, a file reference variable (or better the content of the file where it points to) can be scanned with the LOCATE scalar function to find a specific string or the SUBSTR function can be used for moving a part of the stream file content into a host variable. Within the source code, the GblCsvFile global variable is defined as the CLOB_File (1) variable to be used to get access to the IFS file. The variable is defined globally because the information must remain persistent across different procedure calls. Defining a local static CLOB_FILE variable within the procedure will not work, because the SQL precompiler ignores the STATIC keyword. The LocStrPosData variable is defined as a local static variable (2), because it contains the start position of the next data block to be read. Instead of using static variables, this information could have been stored in the scratchpad memory by using the SCRATCHPAD attribute and defining a SCRATCHPAD parameter variable. When the open call is performed, the CLOB_File variable and the respective data structure subfields are initialized with the IFS file name (GblCsvFile_Name), the length of the IFS file Name (GblCsvFile_NL), and the file operation (GblCsvFile_FO). If a CRLF is found, the data length between the current start position and the position of the next CRLF is determined and the data beginning with the current start position and the calculated length is read into a host variable by using the SUBSTR scalar function. If no CRLF is found, all data beginning with the current start position is read into a host variable by using the SUBSTR scalar function (5). After the data is transferred into a host variable, it can be processed with the native RPG operation codes and built-in functions. In this example, the next separator is searched by using the %SCAN function (6). The column data is transferred into the output parameters. Blank spaces and double quotes are removed with the %TRIM function (7). The date character value is converted into a SQL date value by using the %DATE function (8). For invalid date values, a NULL value is returned by setting the appropriate indicator parameter variable to -1 (9). The character representation of the amount is converted into a numeric value with the %DEC function (10). For invalid numeric values, a NULL value is returned. On the close call, the SQLSTATE is set to ‘02000’ and the procedure is ended. Because SalesCsv is an exported procedure within a service program, a two-step compilation is required. The READCSV module will be bound to the READCSV service program. The SalesCsv procedure in the READCSV service program is registered as an external UDTF with the CREATE FUNCTION statement in Listing 14. Because embedded SQL is used within the procedure, READS SQL DATA must be specified. Both, procedure name and the service program name must be specified with the EXTERNAL NAME option. The procedure name must follow the service program name and must be embedded in parenthesis (1). In an RPG procedure, names are internally converted into uppercase (except when a case-sensitive procedure name is specified in the prototype with the EXTPROC keyword), and therefore, the procedure name must be specified in capital letters. When running the SELECT statement in Listing 15, the Sales1.csv file is directly read with the SalesCsv_Fnc UDTF and returned as a table. The result table returned by the SalesCsv_Fnc UDTF is joined with the Address Master table to get the customer number and name to return the total amount by customer. Figure 6 shows the condensed data returned by the SalesCsv_Fnc UDTF after having executed the query displayed in Listing 15. A lot of APIs provide the same information as CL commands. Quite often, however, those APIs provide information and functions that are not available through CL commands. Instead of writing the data into a physical file, the List APIs return information to user spaces. A user space is an object consisting of a collection of bytes that can be used for storing any user-defined information. Before calling a List API, the user space has to be created with the QUSCRTUS API. To provide a consistent design, List APIs use a general data structure. This general data structure starts with generic header information that provides among others the offset of the list data section, the number of entries, and the size of each list entry. Note: Within the API and data structure descriptions, the offset of the data structure subfields is used. The offset position is 1 before the beginning of the data structure subfield, that is, Offset 124 means, the appropriate data structure subfield must begin in position 125. The example in Listing 16 shows the source code for the ListMember procedure located in the LISTMBR service program to be registered as a UDTF. Within the ListMember procedure, the QUSLMBR (List Database File Members) API is called for returning the information provided by the MBRL0200 format in a user space. For receiving the data out of the user space, global data structures based on reference data structures (located within the copy members) are created and associated with pointers. The generic header information will be stored within the GblDSListhdr data structure (2). The list data will be read into the GblDSMBRL0200 data structure (3). Those data structures are defined globally for keeping the information persistent between the different procedure calls. The GblDSUsrSpc data structure contains the name and library for the user space to be generated. (4). Within the GblDSFileQual (5) data structure, the incoming parameter values (file and library) will be stored, because the QUSLMBR API requires the information being passed in a single 20-character string. GblDSErrCde (6) is a data structure that is required in a lot of APIs for returning information if an error occurs. The ListMember procedure or better the UDTF requires two input parameters, the file name and the library name (7). Both parameters are defined as varying length character fields, which is the best practice for passing input strings. Contrary to the previous examples, the UDTF is registered with the FINAL CALL option. At the open call, a pointer on the user space is resolved by running the QUSPTRUS API and the data is read into the GblDSGenHdr generic header data structure (9). The subfield values in GblDSMBRL0200 are transferred to the output parameters (11). The 13-character date values for the creation and change date are converted into SQL timestamp values. If an invalid date or time value is encountered, a NULL value is returned. (12). On the close call invocation or as soon as all list entries are processed, SQLSTATE ‘02000’ is returned. The service program containing the exported procedure ListMember is created successfully. The CREATE FUNCTION statement shown in Listing 7 can be run for registering the ListMember procedure as an external UDTF. In Listing 17, the ListMember_Fnc UDTF is performed for returning all the members with a member type that includes RPGLE that are modified on the current date. The result table returned by running this query is shown in Figure 8. Based on the examples presented in this article, you should now be able to write your own UDTFs. The combination of SQL and external UDTF support makes it easy for you to access data in traditional DB2 objects and data in non-database objects, such as program-described files, comma separated files, or user spaces. And now, have fun in writing and using your own UDTFs.